Our High School Game of The Week was out in Howard Kansas last night as we followed the matchup between the Sedan Blue Devils and the host of West Elk High School. Sedan came into the game unbeaten in district play putting them a top of the Southern Border ranks at 11 and 4 overall on the year. The hosting West Elk Patriots came in right at .500 at 7-7 on the year though have played well in district play and hoped to upset the rival at home. The first two quarters were very evenly played quarters. More defensive play than scoring, both team forcing turnovers, but also missing second chance opportunities making it a very low scoring game. At the half it was actually West Elk that held the lead at 18 to 16 as they hoped for more scoring struggles from Sean in the 2nd half. The 3rd quarter was more of the same, though both teams started to score more bucket as West Elk was able to stretch their lead to as many as 6 by one point but it didn't last long. 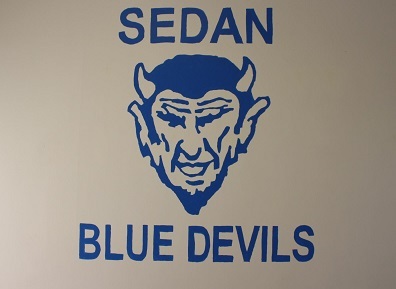 Great play calling and execution by Sedan overpowered West Elk in the 4th as the Blue Devils were able to gain momentum, able to keep that momentum and eventually finish the game leading by 10. A low scoring game finished with the Blue Devils winning 49 to 39 over the West Elk Patriots. Our next game of the week will be in Oswego as they host Colony Crest High School, covered back on FM 104.1 KGGF Greatest Hits.